Cave painting from the Lascaux complex in Dordogne, France. Often called the ‘Chinese Horse’ for its resemblance to ancient Chinese paintings. 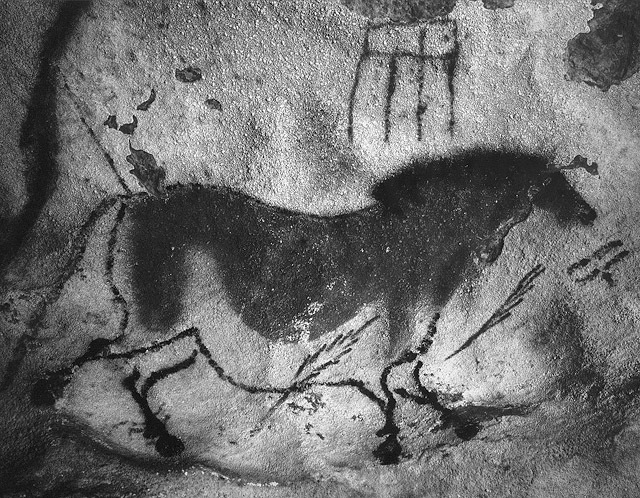 The comb-like abstract mark appearing above the horse can be seen in cave paintings for centuries afterward; there also appears to be something like a quill in the horse’s belly. If “letters are things, not pictures of things,” as Eric Gill wrote, then even our seemingly phonetic-only alphabet can be seen as rich with symbolism and story. In what dark mists of prehistory did writing begin? When I was young, we were taught in school that Sumerian cuneiform was the first writing, developed in about 2700 BCE and therefore the first indicator of a civilized culture. The reason for its development, we were told, was to keep accounts of economic transactions. This assumption has been basically unchallenged for a very long time, but that is slowly changing. The first inkling I had that there might be earlier marks that could be referred to as a kind of writing was several years ago, when I happened across a book written in 1991 by Marija Gimbutas, The Civilization of the Goddess. 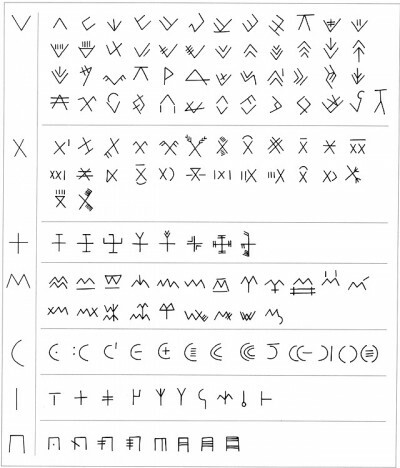 In it was a chapter entitled “The Sacred Script.” There I found a chart of ancient marks that had been found in what Gimbutas termed Old European cultures that flourished 8500 to 5500 years ago in Southeastern Europe. These marks looked like V, X, T, C, I and other letters to me. It was electrifying to think that the roots of writing might actually be found in these much older cultures. Gimbutas wrote that the objects most commonly showing these signs looked to be ritual vessels, altars such as small tables, plaques, and most intriguingly, small anthropomorphic sculptures, usually female and in great numbers. These objects were found not only in public areas but around private hearths, suggesting their use in home-based devotions. The other category of objects carrying these inscriptions were spindle whorls and loom weights. These objects belonged to both the practical and religious spheres, since weaving was in ancient times described as a gift from divinity, most commonly goddesses. Any discussion of early writing of course brings up the question: what IS writing? The answer will depend on who you ask. Almost anyone in Western civilization will answer that writing is a way of presenting language using alphabetic, i.e. phonetic, symbols. This kind of writing is called phonographic, because it is based on sound, either individual letters or syllables. However, if you ask people in China or Japan what writing is, the answer will be quite different, for these methods of writing present an entire word or concept in a single symbol or composite of symbols. This is called logographic or ideographic writing. It is significantly more abstract. 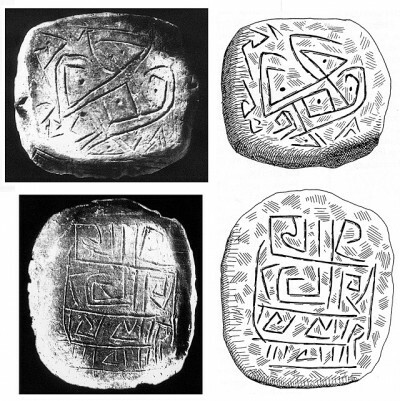 Ancient writing systems are unique in the large number of signs used, because they are primarily logographic, whereas phonographic systems of writing in comparison have relatively few signs. Alphabetic writing is a relatively recent development, and even in European and Mediterranean societies of antiquity, writing began in a non-phonetic way, for example Egyptian hieroglyphics. 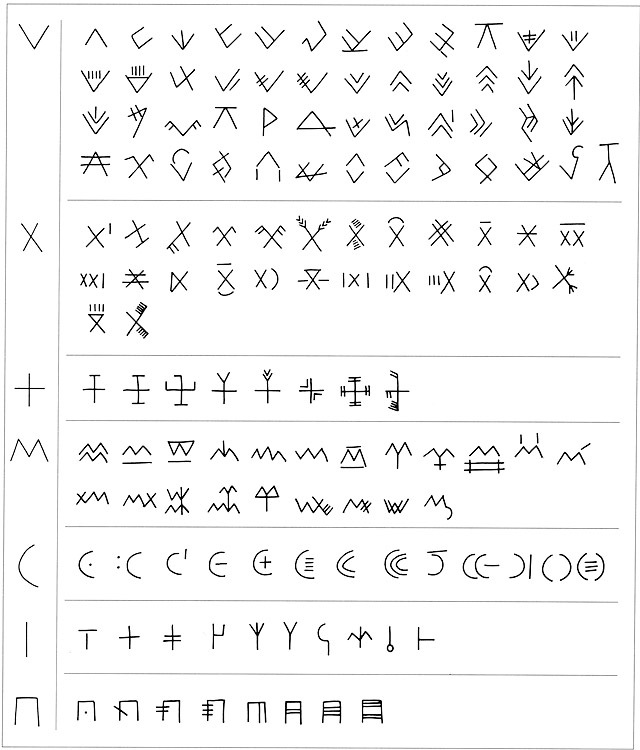 Early writing systems evolved with the intention of fixing ideas or practical information for later transmission to others. What makes these particular ancient marks more than mere decoration? Typically objects are decorated with symbols which are arranged symmetrically. But these particular signs seem to be arranged primarily for the communication of ideas, with aesthetics being of secondary importance. Though some in the archeology community would like to dismiss these marks as mere “potter’s signatures”, their position inside vessels, under the brims, or only on one side of figures suggest a different, more idea-based intent. These marks, some of them in rows separated by lines, were incised into clay or stone, as shown in the Gradesnica vessel from the later Neolithic period. Often called Vinca script by Marija Gimbutas, it was later realized by scholars that these marks were used by multiple cultures in the area of the Danube river, with its tributaries and valleys being the heart of the Old European culture in southeastern Europe. These various cultures thrived 5000 to 7000 years ago and shared the use of many of these signs. These artifacts predate Sumerian, Phoenician or Egyptian civilizations by many hundreds or even thousands of years. The signs are now more properly referred to as the Danube or Old European script. These linear forms and marks seem to have served our Neolithic ancestors as a writing system, though indecipherable to us now. In the absence of a Rosetta Stone, decipherment of these marks will remain a mystery to us. Marija Gimbutas is the scholar most famously known for her work with these symbols. She was an archeologist at UCLA for twenty-six years, until her retirement in 1989, and before that worked for thirteen years at Harvard after emigrating to the United States from her native Lithuania in 1949. Between 1967 and 1980 she was the project director for five major archeological digs in eastern Europe (former Yugoslavia, Macedonia, Italy and Greece). In order to understand the meaning of her findings, she used her knowledge of linguistics, mythology, and comparative religions, calling this interdisciplinary approach archaeomythology. At the time this was controversial, but methods of attaining knowledge have changed dramatically over the last few decades, and the interdisciplinary nature of study has allowed new light to be cast upon old subjects previously restricted to their assigned “box.” Joseph Campbell, the noted mythologist, often spoke of the work of Marija Gimbutas in the later years of his life, stating that if her findings had been available earlier in his career, he would have “revised everything.” Her conclusion, that the importance of female forms in these Neolithic cultures expressed the reverence of our ancestors for the great natural cycles of fertility/birth, death and regeneration, has been revolutionary to say the least. 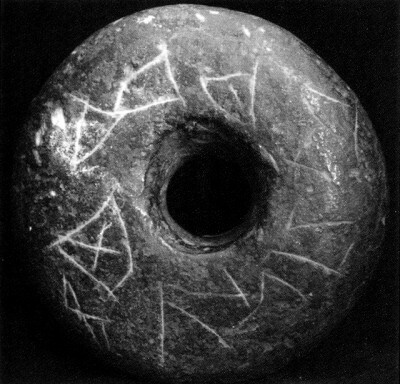 Gimbutas was not the first scholar to surmise that ancient marks were a form of writing or abstract signs. Beginning in 1959, the French archeologist Andre Leroi-Gourhan made an extensive study of more than sixty Paleolithic caves dating back 17,000 years or more. The paintings in these caves have garnered the most attention for their beautiful, naturalistic forms of animals, but in fact these paintings are almost always accompanied by abstract signs and marks that obviously had meaning for their makers. Leroi-Gourhan grouped them into two categories: the “full” marks seemed to be shapes that looked like vulvas and wombs, while the “thin” marks, often single or dotted lines, seemed to refer to the phallus. Both natural forms were also often drawn realistically. The caves themselves were often discovered in the most remote, inaccessible areas, leading researchers to surmise that they symbolically represented womb-caves of the earth. During the 1960s, archeologist James Mellaart supervised the excavation of the Neolithic site Catal Huyuk in modern-day Turkey, and observed many of the same signs, as well as confirming what Leroi-Gourhan had noted, that the female signs and animals were usually centrally positioned, while the male signs and associated animals appeared in more “satellite” locations. 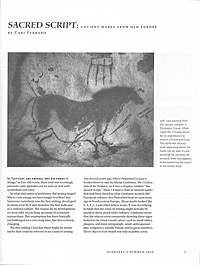 Recently Genevieve von Petzinger, a scholar from the University of Victoria in British Columbia, Canada, undertook a study to collect all of the abstract signs connected with the earliest cave art, dating back 30,000 years, and was astonished to find 26 abstract signs appear again and again next to the animal paintings. Many appeared in pairs or in groupings, indicating meaning on the part of the artists. Researchers speculate that the marks had spiritual significance for our ancestors and thus illustrate abstract thinking much longer ago than previously believed. The Nursing Mother of Rast, from present day Romania, early 5th millennium BCE, height 12 cm. Inscribed on front, back and sides; the child is also inscribed. Photo from “Goddesses and Gods of Old Europe;” schematic from “The Civilization of the Goddess,” both by Marija Gimbutas. The drawn schematic of the markings, separated from their rough background, shows a set of symbols that can be seen as a kind of writing, separated by diagonal lines. The inscribed figure shown here, the Nursing Mother of Rast, is from the Old European Vinca culture in western Romania. When I found the photo of this madonna, it was the two facing crescent shapes I suddenly recognized. I used it as my “S” when I devised my “goddess alphabet” in 2003, based on the catalog of marks from The Civilization of the Goddess. Joan Marler, who was Gimbutas’ editor in her later years and founded the Institute of Archeomythology to carry on her work, recently explained to me: “The two facing crescents, when positioned to make the S shape, are special indeed. They define the place, in the center of the double spiral, where the inward direction turns to spiral outward. In other words, it is the place where one polarity becomes the other. The S shape can be seen as the distillation of the entire double spiral.” The spiral: symbol of birth and rebirth, the heart of the labyrinth, the spirit ancestor of our letter S.
The repetition of certain signs from the Danube script in the Linear A tablet points to the Minoan civilization as being the inheritor of this writing system. The Linear A and much of the Linear B tablets remain undeciphered, but their similarity to some of the signs of the Danube script suggest that aspects of these Eastern European cultures migrated further out to the Aegean civilization of Crete. And paper in the other. It is to be remembered that many artifacts covered with inscriptions were found in graves, perhaps offering similar advice to the dead, thus establishing a very old connection between writing and ancestor veneration. 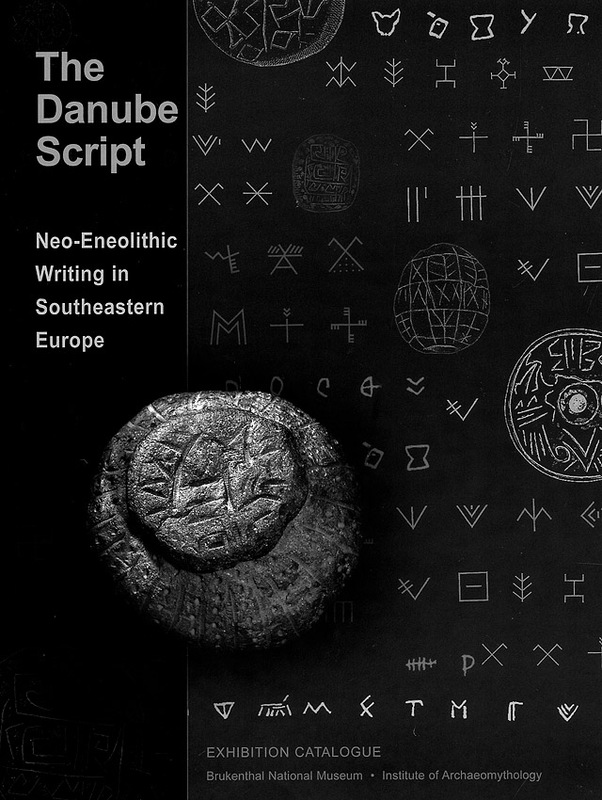 The Danube Script, a catalog containing papers and photographs from the symposium presented at the Museum of History in Sibiu, Romania, in 2008. The noted font designer Sumner Stone has also been mining this vein of pre-Roman writing, most notably in his font Numa, which includes several of these ancient marks as alphabetic figures. On his website is a fascinating slide show using this font and showing some of his source material, though he does not delve quite as far back as the archeomythologists. The link to his slide show is in the bibliography following this article. It is powerful to see these incised lines, and as a scribe, to imagine making them into clay, so many thousands of years ago. For what reason were they made? Prayer? Protection? Invocation? For me, writing is a creative, sacred, nourishing act. As a calligrapher and as a woman, the idea that writing may have been a means of enacting a magical practice that is thousands of years old and may have originated in response to women’s mysteries as the life-givers is far more exciting than those old Sumerian accountants. These monoline forms stand in ancestral line behind Etruscan, Minoan, and runic forms of Europe and the Mediterranean. The artifacts with these ancient inscriptions are an expression of some of the earliest forms of human consciousness in Europe. Goddesses and Gods of Old Europe; Marija Gimbutas,; University of California Press; 1982. 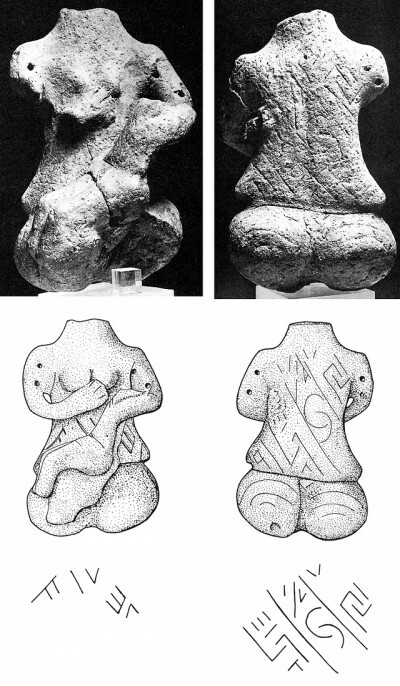 Originally published as Gods and Goddesses of Old Europe in 1974, Gimbutas fought hard for the title to be changed because of the overwhelming evidence of much larger numbers of female figures found at Neolithic sites. I am deeply indebted to Joan Marler, director of the Institute of Archeomythology, for her help in making the two books published by the Institute available to me for research, and for fact-checking this article. Cari Ferraro is a calligrapher and bookmaker who has been exploring the Old European script since 2002. She devised a “goddess alphabet” based on Gimbutas’ catalog of marks and has used it and other ancient marks in The Charge of the Goddess, The First Writing, A Goddess Alphabet, Alphabet Ancestors, and other handmade books. Below is a link to the article above as it appeared when published in Alphabet 35.3 in the summer of 2010 in San Francisco.